UPSC NDA 2018 recruitment notification along with 383 jobs of NDA & NA (2) Posts was released by the Union Public Service Commission and get the related catalogs of notification at the main website @ www.upsc.gov.in., From on 6th June to 2nd July 2018, you could apply online, and could check the see the examination dates are on August 2018. 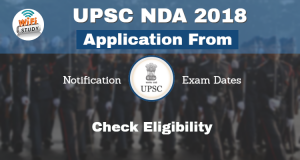 Latest Updates (02nd June 2018): UPSC NDA(II) 2018 Short Notification released Check for more news on thsi site. Stay tune to our page for more updates. UPSC NDA & NA (II) 2018 Notification is going to arrive on 6th June 2018 in the official site of Union Public Service Commission (UPSC). Employing new batch of candidates in three defense sectors of India that is Army, the Navy and the Air Force together is the main object of this exam notification. The selected candidates from this exam will give training for a specific period of time and later on completion of the training for this batch, jobs will be given in any one of the three sectors. For this notification, many people will wait to apply for this UPSC NDA & NA exam. Usually, this exam will conduct in two times in a year. The first exam is in the first six months of the year and UPSC NDA (I) in the next six months of the year. So the arriving notification full details are dropped @ Recruitmenindia.in. Scroll it. UPSC NDA (II) 2018 Online Application Form: Union Public Service Commission is the central government job recruitment board which looks after the Group A and Group B posts. In addition to these posts, the navy, Defence jobs notifications also will be released by this UPSC board. In the sense only, now it is in the plan of releasing the National Defence Academy (NDA) and Naval Academy Exam (NA) I 2018 Notification on June 2018. Actually, the notification has to have arrived on 6th June 2018 . So surely you can see the notification on that date @upsc.gov.in. The complete qualifications for UPSC NDA 2018 notification as per the job wise. Army Wing of National Defence Academy: Individuals who have passed Class 12th or equivalent examination conducted by a State Education Board or a University. 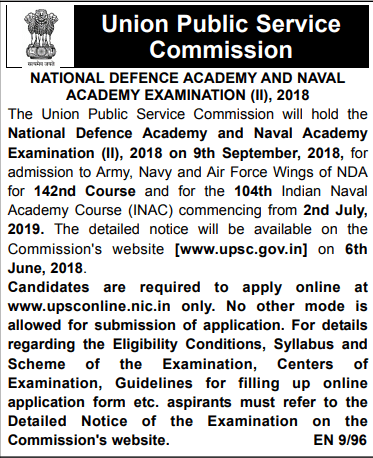 Air Force and Naval Wings of National Defence Academy, 10+2 Cadet Entry Scheme at the Indian Naval Academy: Individuals who have passed class 12th or equivalent with Physics and Mathematics conducted by a State Education Board or a University. This year Appearing individuals for Class 12th exam or equivalent examination conducted by a State Education Board or University are also eligible to apply. Note: Those who have failed INSB/PABT (Pilot Aptitude and Battery Test) shall not be eligible to apply for NDA 2018. Candidates, age must be as per the UPSC NDA 2018 Notification that is the male candidate should be born not earlier than July 02, 1998 and not later than July 01, 2001 are eligible. Applicants who will be get placed on the shortlist, they will undergo one year of the training period. Approxmatically, Rs.38,430/- per month has offered for the placed applicants. The approaching UPSC NDA & NA Posts Recruitment @upsc.gov.in will be live from 6th June 2018. As per the previous updates, the application form also will commence from the day of notification and will end on 5th Feb 2018. But now the dates seem to be postponed. Just wait and watch the updates for the declaration of the official notification. High Count of the candidates has the passion to join in the administrative services in the Naval, Army, Air Force sectors. For them, this UPSC NDA is the best way. 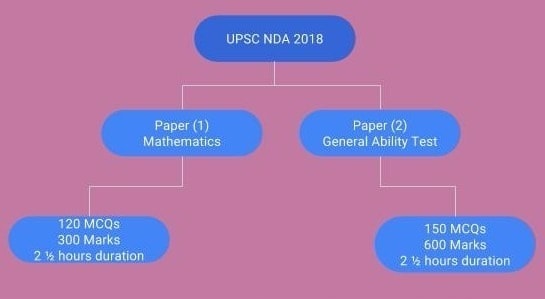 If the UPSC NDA is held on August 2018. then it is the UPSC NDA 2 Exam. Then in June 2018, that UPSC NDA 2018 Notification will appear. This UPSC NDA & NA Posts Selection Process are the written exam, medical fitness test, verification of documents. Services Selection Board will lead all these rounds on behalf of UPSC. The forwarded candidates in all these three rounds will get admission in the nee training batch of the NDA programme. The successful training completed candidates will be placed into the 383 administrative posts of the any one of the Naval, Army, Air Force departments.